Ben is on hiatus this week but will return next time! Latte: Abby's working on the Canopy Socks, Cassidy, Tree of Life Socks and Flagstone. Grande: Finished Norie hat and the Sideways Grande Cloche. Brewing: Jared Flood recommended four books, which have given Abby the courage to knit fearlessly: Knitting without Tears, Knitting Workshop, Knitting from the Top and Knitting in the Old Way. Tip Jar: Abby advocates knitting promiscuity. 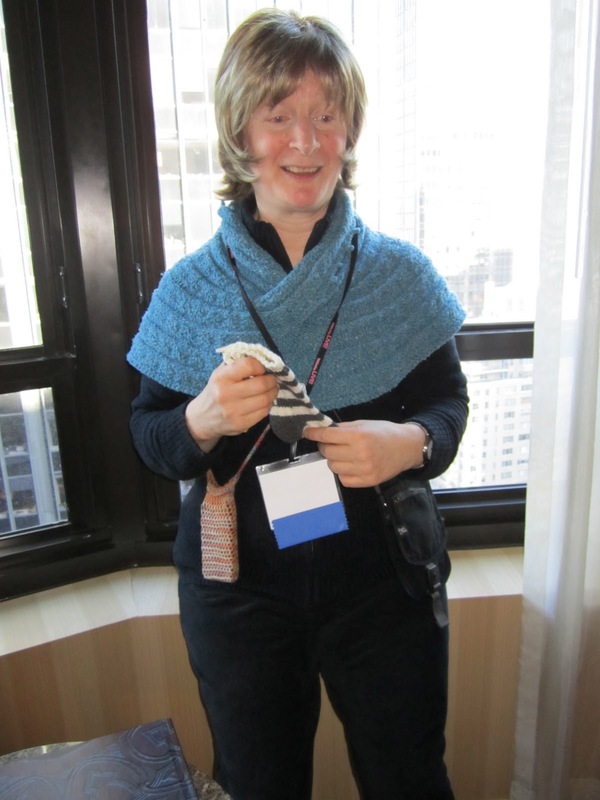 Chai: Interview with Cat Bordhi recorded at Vogue Knitting Live. Cat mentions that she collaborated on the design of Frog Tree Pediboo sock yarn, and talks about her new website. Latte: Ben is working on a hat of his own devising; Abby continues with the Canopy Socks and Cassidy. She's also started Stephen West's Flagstone and Gudrun Johnston's Norie hat. An original cowl is still on the needles as well. Grande: Ben finished the Brambles hat with an unplanned modification. Abby finished Chadwick (see photo above). Taste: Abby reviewed The Shetland Trader. She wants to knit everything in the book (except the leg warmers). Chai: Abby had a fabulous time at Vogue Knitting Live, as well as other events around town. She met Felicia Lo of Sweet Georgia Yarns as well as Maria from Subway Knits. At VKL, she attended a lecture by Clara Parkes and took a class with Jared Flood. More tales of VKL will follow in later podcasts. Bite: Inspired by Clara's talk, Abby wants to know "where are your knitting dollars going?" and "do you care"? There's a thread on the ravelry board where you can respond, or simply post a comment here. Tip Jar: Ben recommends charting your designs before knitting them. Abby shares some handy things about ease that she learned from Jared Flood. Latte: Ben is really working on Brambles. Abby's working on Cassidy, Canopy Socks and Chadwick. Grande: Abby finished the Passerine Socks (see photo above) and a new logo for the podcast. Brewing: Ben is designing Guitar Hero mitts; Abby has cowls exploding in her head. Little Taste: Abby waxes rhapsodic about Anna Zilboorg's Knitting for Anarchists and suggests you get yourself a copy! One thing Anna explains is how changing needle size might not change your stitch gauge, but it can wreak havoc with your row gauge. Stir: Abby is spinning Lemon Creme Foot Notes Unspun Pencil Roving from Fiber Optic Yarns. She is making 3 or more ply sock yarn. A Bitter Cup: Ben's Beer Gloves attacked him and they are now doing time out in a corner. Demi Tasse: We both love TV show "The Walking Dead" and the movie "Black Swan". If you are squeamish, however, you might want to avoid both. Abby also has discovered the "historical timeline" feature on Google Earth, where you can see a place literally change over time. News & Events: Vogue Knitting Live is next weekend. Abby will be there. Will you? Latte: Abby's almost finished with the Passerine socks, while she continues to work on Cassidy. 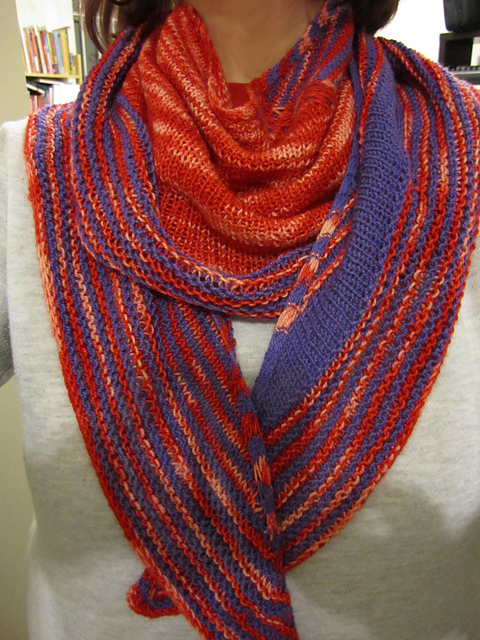 She's also designed a simple cowl. Ben is working on Beer gloves. Grande: Ben finished Chadwick, and Abby finished Pogona, both by Stephen West. Ben is so stoked, he is pursuing other "man-shawls" and welcomes your input! Taste: Abby reviewed Color by Kristin, by Kristin Nicholas. Tip Jar: Ben recommends keeping track of your needle sizes on ravelry; Abby talks about shopping for organizers in the hardware and sporting goods departments. News and Events: Abby is thrilled and amazed to have won the Blue Moon Fiber Arts Rockin'Sock Club contest. Here is a photo of the skein she named "Rumplestiltskein" for the win! Abby will be attending Vogue Knitting Live and would like to meet you if you're going to be there. If you're new to New York, be sure and get yourself a Metrocard, some good maps and check out shopping opportunities (besides yarn)! You can find some shopping advice here. In SoHo, Ben likes Uniqlo, and Abby had to mention the new Doc Martens store on Spring Street. There are some wonderful apps for your smartphone which show you all the transit opportunities in NYC. For a listing of places to spend your money in NYC, look here, but this is just the tip of the iceberg. Finally, don't forget about Camp KIP, organized by Jackie of the KIPing It Real Podcast. The camp is going to be full of podcasters, but space is limited, so if you want to go, get over to the website and sign up pronto! Lots of talk this week! Latte: Ben is working on Chadwick, and Abby is knitting Pogona, both by Stephen West. Ben continues to work on the "Weasley" sweater, see it in progress below. The Weasley sweater, in progress. Abby is also working on Passerine socks by Cookie A.
Grande: Abby finished the Snapdragon Mitts, and also Ben's birthday TARDIS socks. Chai: Ben and Abby went to the Olympia Knitters' Group, where they met up with Rachel from the KnitCents Podcast and many other nice, friendly knitters! (See photo, top). They also attended an early-morning yarn sale at Yorkshire Yarns, and made quite a haul at 40% off! Taste: Ben and Abby reviewed Power Cables by Lily Chin, and both gave it a thumbs up. Bite: We ask, "Should LYS charge to help you with your project?" Please comment here or on the ravelry thread. Demi-Tasse: Ben is very excited about a video/computer game called "Braid" which adds time as the third dimension in a side scroller platform game. You can purchase it here. Brewing: Ben is inspired by some surprisingly soft acrylic based yarn, and Abby is going to design a top down sweater using her handspun. Tip Jar: We revisit the idea of alternatives to the standard long-tail cast on. We've made a video of the Old Norwegian cast on, which you can watch here. We also recommend going to the zoo, a museum or other visually stimulating place for inspiration.